WILL THE DIABLO NUKES SHUT BEFORE THE SAN ANDREAS RUBBLE-IZES THEM AND RADIATES LOS ANGELES? A major court opinion has given safe energy advocates new hope two Diablo Canyon nukes can be shut before the San Andreas fault turns them to rubble, sending an apocalyptic cloud into the bodies of more than ten million people . The huge reactors—California’s last—-sit on a bluff above the Pacific, due west of San Luis Obispo amongst a dozen earthquake faults, They operate just 45 miles from the San Andreas. That’s half Fukushima’s distance from the fault that destroyed four reactors there. Diablo’s wind-blown emissions could irradiate the Los Angeles megalopolis in less than six hours. The death toll could be in the millions, the property damage in the trillions. The owner, Pacific Gas & Electric, would not be legally liable. Last year a deal to shut Diablo’s two reactors in 2024 and 2025 was struck by the state, PG&E, the union, surrounding communities and some environmentalist groups. Diablo’s federal licenses expire in those years, and PG&E agreed not to seek renewals. The power, they said, could be replaced with wind turbines and solar panels. But the $1.7 billion in rate hikes stipulated in the deal must be approved by California’s Public Utilities Commission. A proposed decision by Administrative Law Judge Peter V. Allen would limit them to less than $200 million. The CPUC must now factor Allen’s decision into how much it allows PG&E to charge. If it honors Allen’s opinion, the company must then decide whether they’ll continue to operate the two nukes, which increasingly look like money losers. The company’s standing is not exactly sterling. Massive fires have just swept through northern California, killing at least forty-one people, turning some 5700 structures and whole forests, rural communities and much of Santa Rosa into smoldering ash. (The Trump Administration has just omitted from its latest budget any federal aid to the region). The San Jose Mercury-News and others have loudly speculated that PG&E may have caused the conflagration by failing to maintain power lines that were blown over in a wind storm. Local fire departments were already complaining that trees and underbrush were being sparked by poles and wires PG&E had failed to maintain as required by law. At very least PG&E now faces a firestorm of lawsuits that will soar well into the billions. Criminal prosecution is also likely. In 2010 a major fire killed eight people and torched an up-scale San Bruno neighborhood. The cause was badly maintained gas lines—-for which the company had been cited repeatedly. Fines exceeded $1.4 billion. Criminal prosecution remains unresolved. Other costly lapses have plagued PG&E through the years. Some involve Diablo itself, which opened in the mid-1980s amidst America’s biggest No Nukes civil disobedience campaign, involving thousands of arrests. Dr. Michael Peck, the NRC’s in-house inspector at Diablo for five years, has warned that the reactors cannot survive a likely earthquake, and should close immediately. He has since been transferred to Chattanooga, Tennessee. Because much of Diablo’s aging workforce is retiring, or beginning to look elsewhere for job security, PG&E wants subsidies to retain skilled staff to run the place. Judge Allen specifically rejected much of the rate hike designed to meet that crisis. The State Land Commission is also being sued by the World Business Academy of Santa Barbara over key leases granted in the 1970s . The SLC gave PG&E a waiver on doing legally-required Environmental Impact Reviews. (Gubernatorial candidate Gavin Newsom is one of the three California Land Commissioners who voted in favor of the waiver). Should the Business Academy win its suit, or should the PUC honor Judge Allen’s decision, and PG&E alter its timetable, those leases might be revisited. Without them, Diablo would almost certainly be forced to shut. Challenges have also been raised against approval from the California Coastal Commission of Diablo’s cooling system. Seeley and other activists have asked the general public to pressure the PUC, state agencies and politicians like Newsom to get Diablo shut sooner rather than later. “Until they can specify the exact date and time the San Andreas and those other faults will go off,” says Seeley, “nobody should feel safe.” ( additional quotes from Linda Seeley came from phone interviews this week). 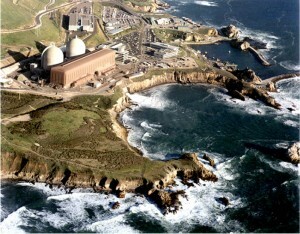 Those interested in helping to shut Diablo Canyon should go to www.mothersforpeace.org. Harvey Wasserman’s Solartopia! is at www.solartopia.org. He hosts prn.fm‘s Green Power & Wellness Show, and KPFK-Pacifica’s California Solartopia.